At the turn of the millennium, an effort was launched by a Swiss foundation to identify the ‘New 7 Wonders of the World’, through a “decidedly unscientific” polling method allowing the public to vote – online or by phone – for their favourites from 200 locations. Among the many criticisms the campaign faced was the fact that the only surviving Wonder of the Ancient World should have to compete alongside much newer sites. 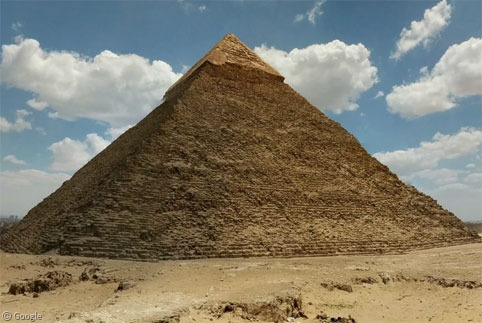 As a result, the Great Pyramid of Giza (Photosphere by Andrey Ilyin) was granted an honorary place on the list, meaning that eight locations were eventually chosen. The Great Pyramid – the oldest and largest of the three pyramids at Giza – is dated to around 2560BC. 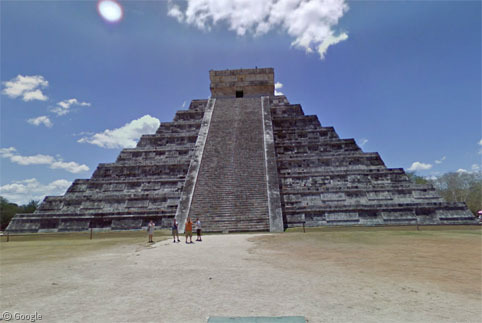 Having taken 20 years to build, it was the tallest man-made structure in the world for close to four millennia. An estimated 2.3 million limestone blocks weighing up to 80 tons were transported from more than 800km (500 miles) away. Little of the original polished finish remains, just at the crest of the pyramid, and some fragments at the base. It is one of two locations on the list that this writer has been lucky enough to visit. This Photosphere by Dennis Sylvester Hurd. 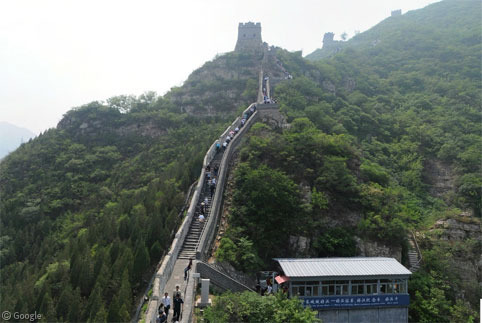 Although UNESCO was originally involved in the project, it soon pulled out when the organization realized it was supposed to provide equal treatment to all of its World Heritage Sites, and not show any favouritism. New 7 Wonders claimed that more than 100 million votes were cast, making it possibly the largest opinion poll ever conducted. With 200 locations to choose from (later reduced to 21 finalists), the public voting process quickly became an exercise in seeing which governments, tourist associations and/or media outlets could best galvanize the population to make the effort to support their local landmarks. Brazil was one of the most successful, with extensive campaigns getting an estimated 10 million votes to ensure that Rio de Janeiro’s Christ the Redeemer statue appeared on the list, as the most recently-created site. 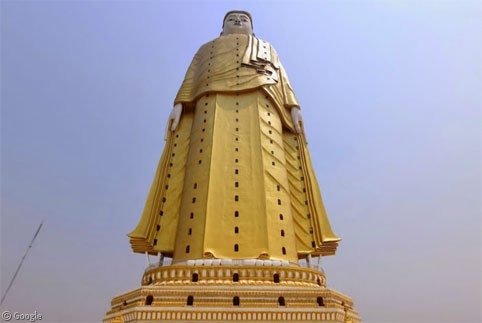 The 30m (98′) statue is made of concrete and soapstone; it took 9 years to build and opened to the public in 1931. Parts of the statue were damaged by a lightning strike in 2008. A major restoration followed in 2010, but earlier this year fresh damage to the right hand was sustained in another lightning storm. 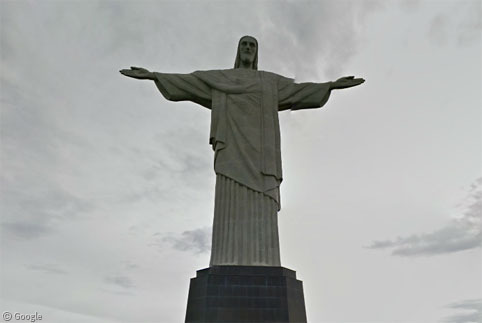 The statue stands on top of the 700m (2300′) Corcovado Mountain, meaning it can be seen from much of the city. 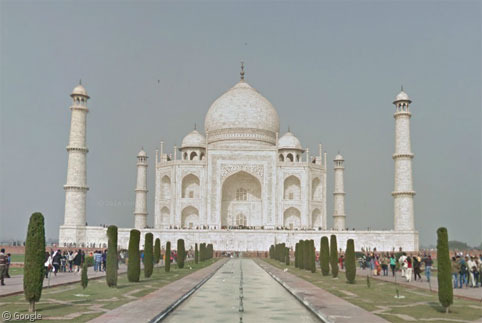 The other site which I’ve had the pleasure of visiting – twice in this case – is the Taj Mahal in Agra, India. 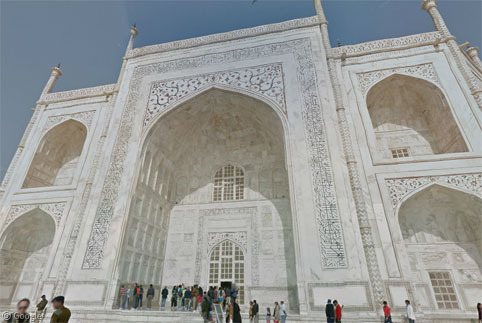 The white marble mausoleum was built by Emperor Shah Jahan for his wife Mumtaz Mahal, with work being completed in 1653. Given the excellent Street View coverage of the whole complex, we’ll likely do a full-length post about it in the future. 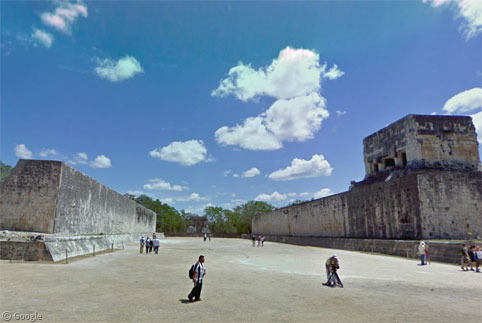 The same is true of the Mayan site Chichen Itza in Mexico, which dates from about 600 AD. 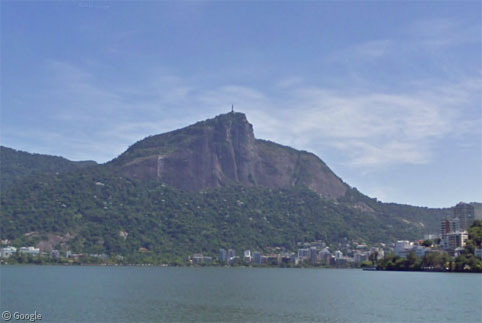 The El Castillo pyramid is about the same height as the Christ statue in Rio. Sunset on the spring and autumn equinoxes creates a serpent effect on one of the staircases. 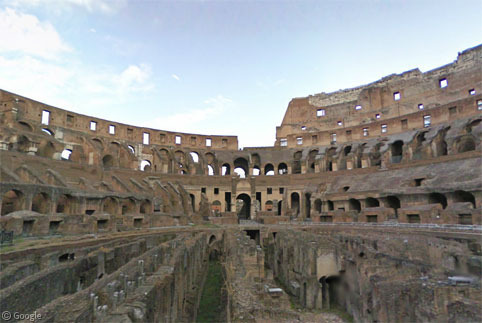 The final location on the list with Street View coverage is the Colosseum, which we visited as part of our Ancient Rome post last year. 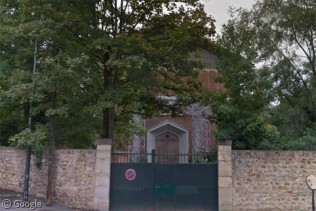 It dates to the first century AD. Thankfully the remaining sites on the list have Photospheres which allow us to take a look at them in more detail than satellite view. 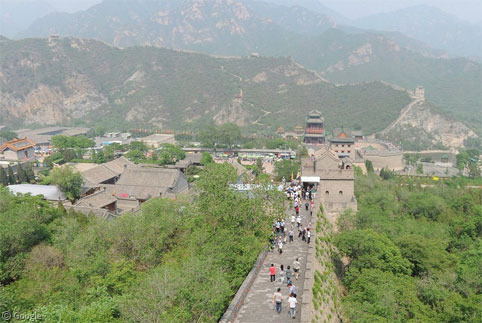 The oldest of the ‘new’ wonders list after the Great Pyramid is the Great Wall of China, which dates to 700BC and stretches for more than 6000km (3800 miles) along the southern edge of Inner Mongolia. Photospheres by 고기만. 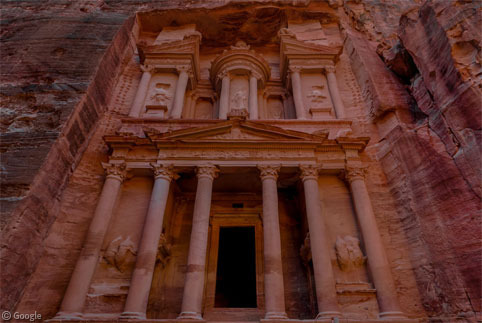 In southern Jordan, the historical city of Petra made the list after the country’s Queen encouraged the public to vote in support of it. 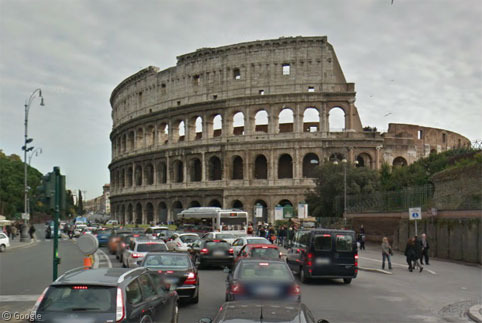 The city was established around 312BC. 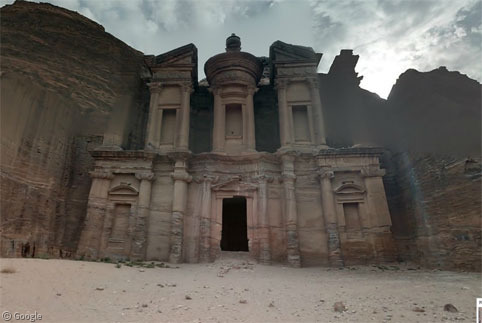 Photosphere of the Treasury by M Attef and of the Monastery by Aubrey Keller. And last, but by no means least, Machu Picchu in Peru, probably the location from the list that I would most like the opportunity to visit. 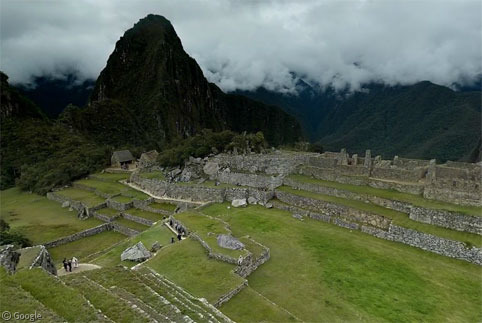 It dates to the Inca Civilization of the 15th century. 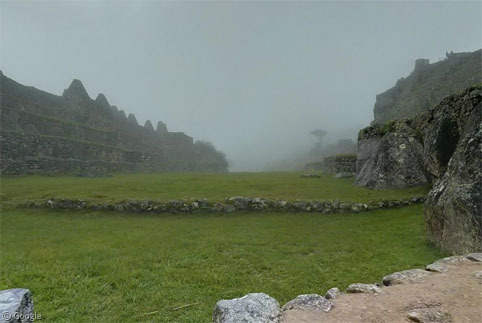 A series of connected Photospheres by Ping Chen allow a good exploration of this spectacular site. You can read more about the New 7 Wonders of the World at their website (where voting is underway for the New 7 Wonders Cities) and on Wikipedia.